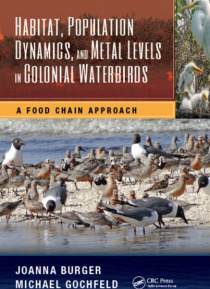 This book is a result of the authors' more than 40 years of study on the behavior, populations, and heavy metals in the colonial waterbirds nesting in Barnegat Bay and the nearby estuaries and bays in the Northeastern United States. From Boston Harbor to the Chesapeake, based on longitudinal studies of colonial waterbirds, it provides a clear picture of the toxic trends and effects of heavy metals… in the aquatic environment. The authors take a food web, ecosystem approach to contaminants, using population dynamics, habitat selection, and inputs to the bay to examine metal levels. They also look at the human dimension, discuss what metals in birds tell us about human exposure, and describe stakeholder involvement in these issues.The book covers numbers and dynamics, colony sites and locations, and prey contaminant levels, and compares them to other comparable coastal estuaries. It uses colonial waterbirds as the focal point for an ecosystem approach to metals that begins with prey fish and goes through invertebrates to humans. Additionally, it provides information based on long-term integrative studies the authors have done on metal levels and bird species and compares the findings with data from the Harbor Estuaries Program, other Northeast bays, the Great Lakes, and the Wadden Sea.